Dan the Business man is a creation of Reallusion's Animation@Work competition winner and Australian cartoonist, Gary Pye. 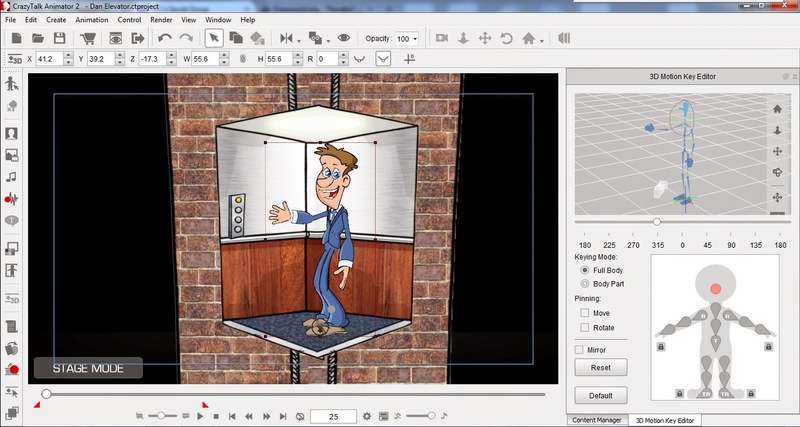 Gary's been flat out creating CrazyTalk Animator 2 content featuring his own cartoon art, which you can purchase from his Reallusion Content Market place store. I love Gary's art so much I've pretty much purchased probably a third or more of everything he's created for CTA2 thus far. 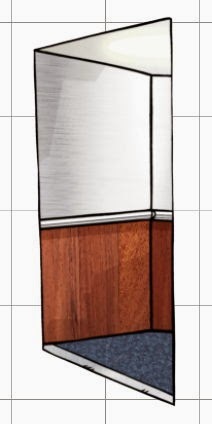 Whilst I can't take credit for his Dan character I can say it was from my suggestion that Gary created Dan the Business Man and the related office content packs (including the lucky gonk/troll prop). So, having made the suggestion, and bought so much of Gary's content it would be wrong to not actually use it. Eventually I'll offer Dan the Business man as an option for my Animation 4 Business clients but I also wanted to have some fun animating him myself. With that in mind, below is the first, of what I plan to be a five or six part series, of animated shorts featuring Dan the Business man. All you need to know is that Dan is a small business owner and he's just leased office space in a highrise building. I actually began this animation back in September but didn't really know it at the time. Gary had just released his Office Content packs for CrazyTalk Animator 2 and I decided to see how I could make a larger office space than the arrangement supplied in Gary's pack. Above right you can see the original office layout then below is my complete background as featured in my animation. Resized and extended office as featured in my Animation. Probably my only criticism of Gary's content is that he draws everything to fit the perspective of room he's designed. Which is not a problem until you want a bigger room. Then you end up with cubicals that don't really fill the space realistically with quite the right perspective. It's not a big issue though. Gary's Office scene only provides for a partial view of the elevator interior. Basically what you can see when the doors open. I needed a full interior of the elevator showing Dan as he made his way up to his new office. Fortunately, because Gary's props are all PNG files, I was able to use CrazyTalk Animator 2's prop editor to copy and flip the original prop then use the mask editor to hide the 'seam'. Elevator Shaft as set up in CTA2. Only the bricks actually move. 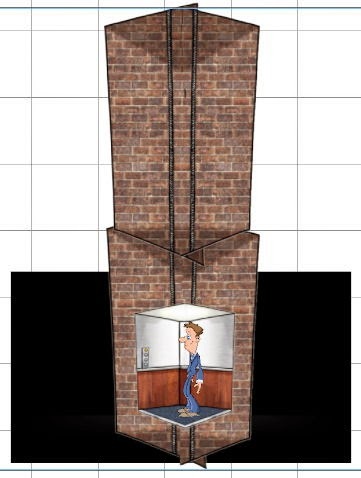 To create the brick shaft of the elevator I did a similar thing to how I created the elevator interior but with Gary's empty elevator shaft brick wall prop. I then linked four of these props together so that I only needed to key frame one and all the rest would follow relative to the first's position. You can see how the scene is set up on the right. Although it looks like the elevator is moving in the final video, it is actually the bricks that are moving behind the elevator car - which required only a start and end key frame. Animating Dan wasn't especially hard to do. Most of his movement uses predefined motions as a base movement which I then tweak at various points if I feel he needs to make a specific hand gesture or head movement to match what he is saying. For example, Dan's last line, "I should probably hire someone to fix that." you'll notice his hands gesture towards the fallen cubical wall as he says "that". CrazyTalk Animator 2 makes these adjustments very easy, especially with G2 characters like Dan that can be manipulated with the 3D motion editor. Using CTA2's 3D motion editor to animate Dan. Dan's voice is my recorded voice which I simply add to the selected character and CTA2 works out all the lip syncing its self. You can further fine tune the mouth movement if the auto syncing gets it wrong or you want to emphasize a specific lip movement however, in general, the software does a good job. One thing I find I have to do with every character animation is do one pass for eye blinks. It's such a small thing but you notice it when a character doesn't blink. Fortunately this is as simple as playing the animation through and clicking the mouse when you want the character to blink. All the sound effects - apart from my voice and the theme music - come from freesound.org. My voice and the cubical wall falling were added directly into CTA2's project files so I could key frame animation to the audio. The rest were added later in Serif's MoviePlus X6. CTA2 is basically a scene creation editor and is not intended for entire productions to be created within it. 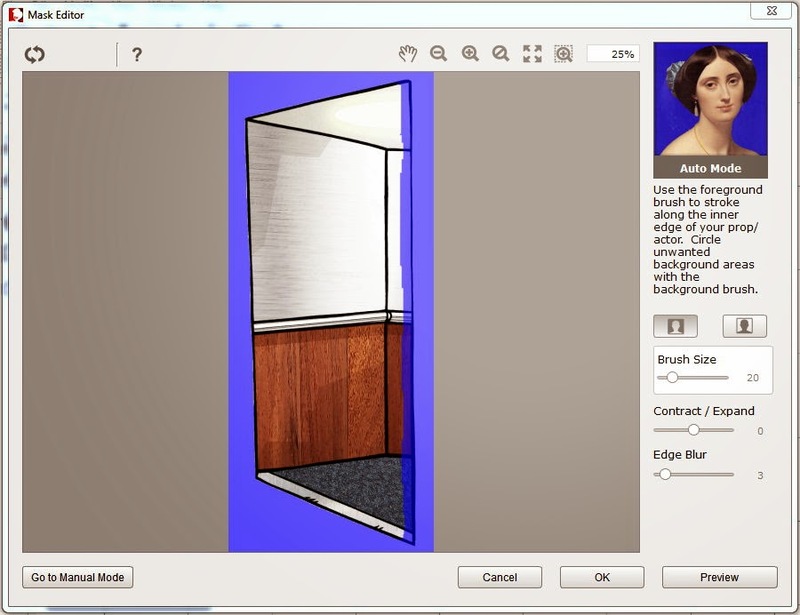 By exporting your scenes you can then assemble everything in a dedicated video editor. My editor of choice is Serif MoviePlus X6. By doing this you can access to a wide range of scene transitions, more tools for creating text titles, post effects like scene filters and you can swap and change audio with more flexibility than inside CTA2. For example all my opening titles and end credits were done in MoviePlus as was adding the majority of sound effects and scene transitions. That's pretty much it. I'm fairly happy with how it all turned out. I do think some of the pre-made motions are a little too animated for what I needed but as I get used to character animation I'm sure I'll get more confident in creating motions from scratch. At the time of writing this, I already have a script written for episode 2. Hopefully it won't be too long before I can put time aside to work on it. That was really interesting. It's nice to hear what to expect when I start leaning CTA2 myself. Well done! Thanks. It has taken me a while to be this confident with CTA2 but at least I'm no longer having to relearn every little aspect for each project like I was a year or so ago. Good to finally know where most things are. You make it sound so easy---I was anxious to read about how you made this-----it was a great 1st episode---Dan is a very likable character. Once you can find your way around the software it does become easier. Character animation is hard and time consuming though. Very interesting blog post, thanks a lot TET! Great post! Specially the sample video, I really enjoyed it. I think the creator of this video having an experience of first day of an office as me.